Most teams rely on processes to maintain high-quality work and stay consistent in their work for their clients. In fact, your team probably already has established processes that teams and individuals follow when completing certain pieces of work, if not entire projects. You could for example create a template subject to onboard your new collaborators, with tasks containing information to read, documents to fill out, and anything necessary to their swift integration. You’ll only have to copy the template subject and to share it with your new recruits. 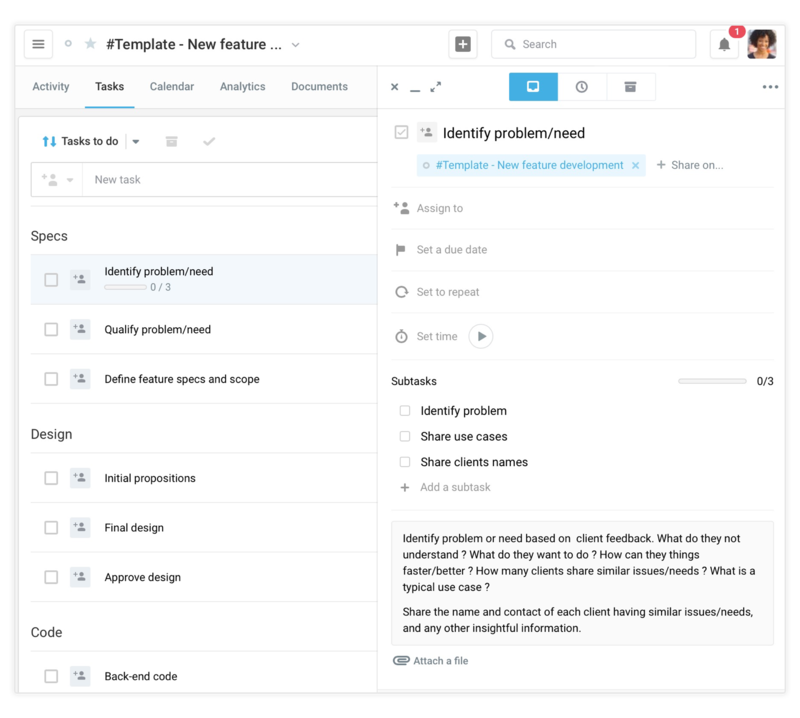 Here is a walkthrough on how to best proceed to create ‘templates’ and make them available to your team so that everyone saves time and maintains a high-quality work output. First, create a new subject - just make sure to make it obvious that this subject is meant to be used as a template. I recommend placing #Template in front of the subject’s name or something similar. **This subject is a template subject**. To copy the subject, click on the subject’s name in the top bar, then select copy this subject. If the option to copy the subject is not available from the dropdown menu, ask the subject officer to either give you the officer’s rights on the subject or copy the subject for you. Alternatively, or additionally, you can post a conversation @mentioning the team members that are most likely to use this template subject in the future so they know it is available and how to use it. Now that the subject is created, we need to add the tasks that are going to be copied over. This is where details matter the most. The more instructions for each task, the better. You can add descriptions, subtasks and files, all of which can be copied over to the new subject. You can even set the time planned for each task if you have Time Tracking enabled. Make good use of separators to define processes and break down work via milestones. This step is optional, but for maximum efficiency, you can also assign tasks. However, proceed with caution: the assignee might not know you are making a template subject. A good idea is to post a comment in the task letting them know that this task is a template and should not be taken into account. You can also cancel assigned tasks so that they do not appear in your teammates’ tasks lists, but their copies will when the subject is copied. Adding followers to a task should also be considered if members of the same team are going to be using this template; however if it’s going to be used by different teams, don’t add followers. Make a dry run to test your template subject by making a copy. Make sure that the tasks are still ordered as planned, and that everything works as expected. Don’t worry, you can delete the subject along with all of its tasks in just a few clicks afterwards. Post a conversation on the General subject, or wherever you deem most appropriate, to let your teammates know a template subject is available. Give instructions for when and how to use it. 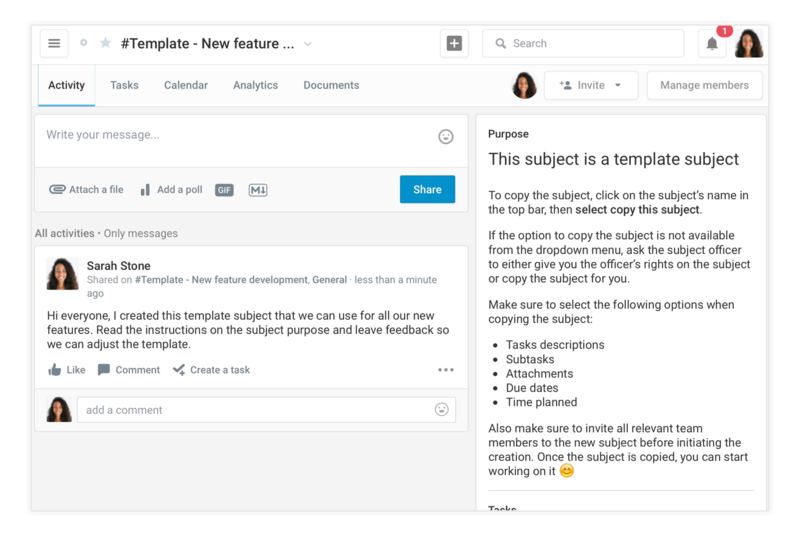 Take the first opportunity to use the template subject and make a copy of it to run your process with your team. 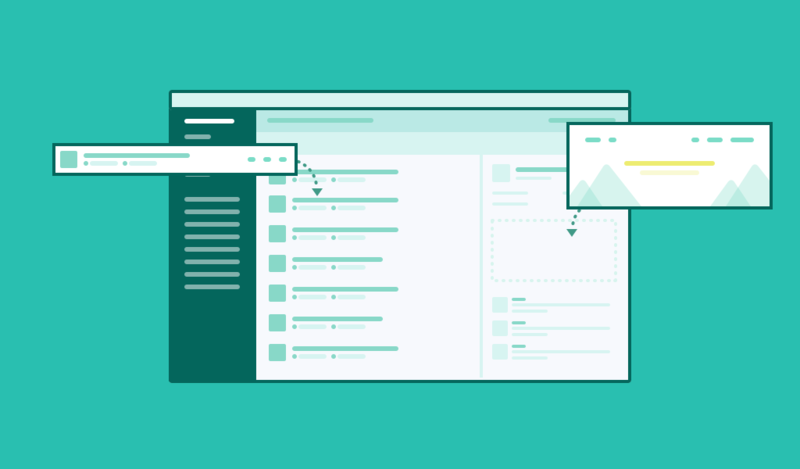 Track the progress and gather feedback from your team members along the way. With all gathered feedback, make adjustments to the template subject to make the next run smoother for your team. Anything will do - for example, adjust individual tasks or task order to tweak the process. That’s it! You can use this process to create as many template subjects as necessary for your team to help everyone save time and to maintain a high performance throughout your projects and processes. Let us know what you think and if you found this article useful!